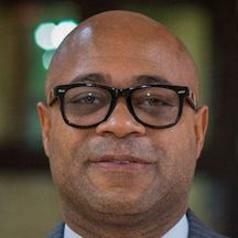 Derrick P. Alridge, Professor in the Curry School of Education, is a U.S. educational and intellectual historian whose work examines African American education and the civil rights movement. He is the author of "The Educational Thought of W.E.B. Du Bois: An Intellectual History" (2008) and co-editor, with James B. Stewart and V.P. Franklin, of "Message in the Music: Hip-Hop, History, and Pedagogy" (2011). He is currently writing "The Hip Hop Mind: Ideas, History, and Social Consciousness" (University of Wisconsin Press) and is co-editor, with Neil Bynum, of "The Black Intellectual Tradition in the United States in the Twentieth Century" (in progress). Alridge is a former fellow of the National Endowment for the Humanities and postdoctoral fellow of the National Academy of Education and Spencer Foundation and Distinguished Lecturer for the Association for the Study of African American Life and History. Alridge is also the founder and director of Teachers in the Movement, an oral history project that examines the ideas and pedagogy of teachers in the civil rights movement.